Well, it was intended to be a Victorian quilt, but I'm not sure about the overall effect. 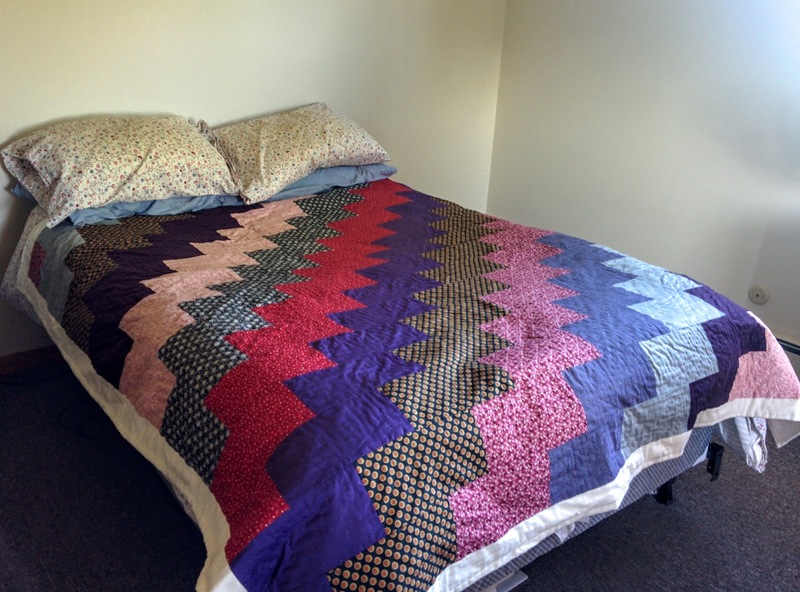 Photographed on my bed for scale, but the quilt is now in Ohio with Julie. I've always meant to do some quilting, but it's never come up. In 2015, I went so far as to buy the fabric to make this one as a wedding present, but the actual Hallowedding bridesmaid dress was more pressing, so I backburnered this and ... forgot about it, pretty much. Then, earlier this year, when I was thinking about the "pattern" challenge, it occurred to me that patchwork quilting is definitely all about patterns. 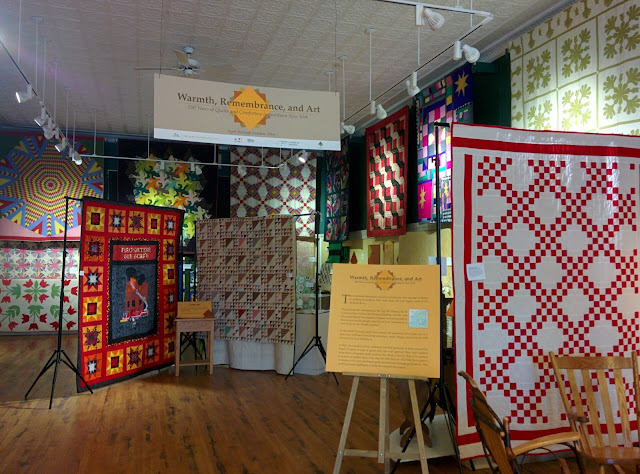 For inspiration and an idea of what I could sew that wouldn't take me too many months, I visited Warmth, Remembrance, and Art: 200 Years of Quilts and Comforters in Northern New York at TAUNY, to which the St. Lawrence County Historical Association had loaned a couple of antiques. I was a little overwhelmed, but this brick pattern struck me as a good one for a first quilt. 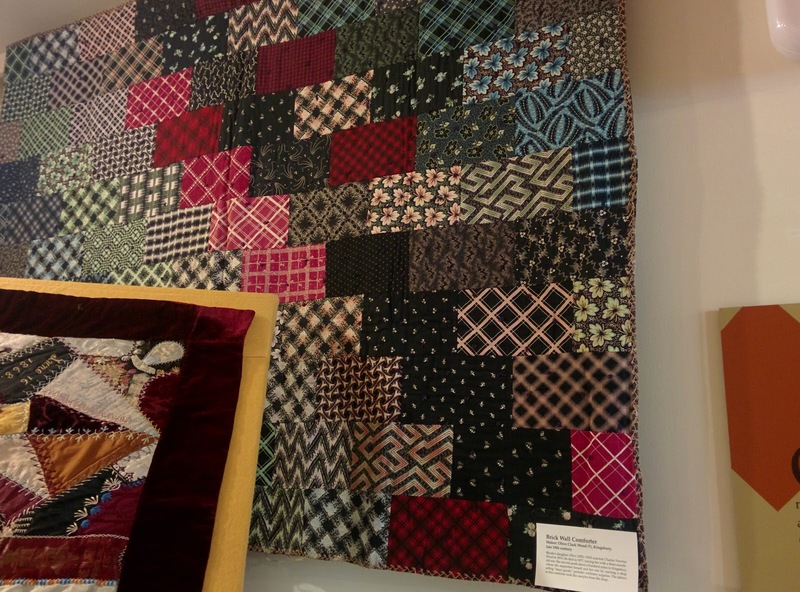 This quilt was made by Olive Clark Wood, who married in 1874 and was widowed in 1877. The curator speculated (reasonably) on the label that these were all samples of material from the fancy goods store she ran to support herself. I made mine much more matchy, but it's still the same basic pattern. When I bought the fabric, I didn't know exactly what I'd make, but I knew it would be an historical pattern so I made sure to aim for plausibly mid-19th century prints and solids (and Julie's favored dark purple colorway). I really wish I had more of this pink print in particular to use for an 1830s day dress, but unfortunately it was going out when I bought this fabric almost two years ago and it's nowhere to be found. I was doing hand-piecing for the short seams at first, but with some advice from Mom I got into the rhythm of doing it all by machine. 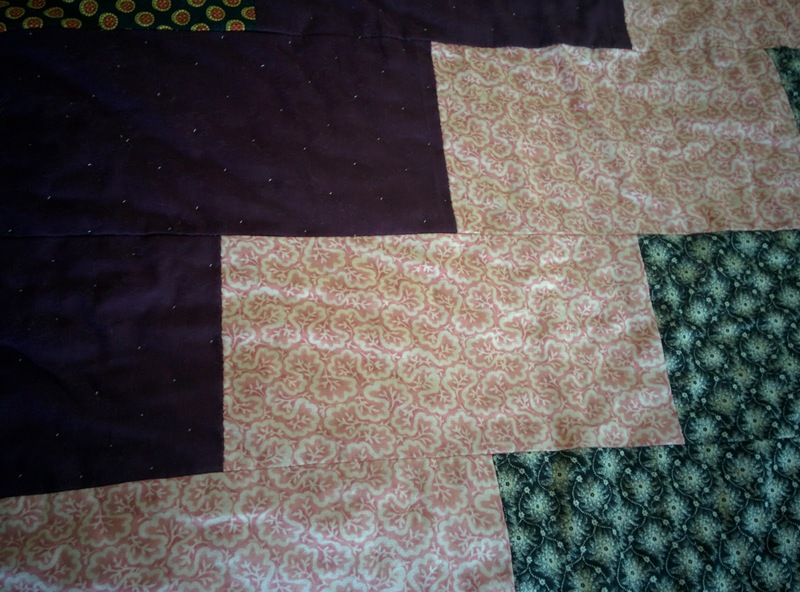 The quilting, though, is all by hand - straight diagonal lines, an inch apart. This is something I've seen on a number of period quilts and seemed nice and simple, but one thing you should know if you try to do this is that the lines increase in length very, VERY quickly.